OpenClinica is an open-source, web-based electronic Case Report Form for capturing and managing clinical trial data. It is optimized for the cloud to ensure that it is always at its maximum performance peak. Thus, you can expect to access your studies anytime and restore your data in the case of system failures. Though OpenClinica is an open-source software, it is compliant with the industry regulations. Among the standards, it meets GCP and 21 CFR Part 11. The application has a comprehensive validation documentation and audit support as well. Furthermore, the OpenClinica supports team provides your research organization with a complete in-person and hands-on training. With this, you can rest assured that your scientists and staffs can maximize the use of the solution in their tasks. With OpenClinica, your research sites can produce more studies in a year. That is because the software’s interface is an intuitive one that allows scientists and their assistants to drill down into study data and gain accurate information. More than that, the solution ensures that the workflow keeps going by automatically alerting users of the steps they need to take for the study to move to the next stage. OpenClinica facilitates the stringent control of operations regarding studies. As the administrator, you have access to powerful tools that let you review findings, answer inquiries, and highlight errors and questionable information. The application is equipped with highly developed edit checks as well for you to make doubly sure that data inputted in the system is accurate, thereby allowing you to close studies at a more rapid pace. Monitoring study activities do not have to be an arduous task for scientists and accompanying staff. OpenClinical’s dashboard is a user-friendly one that displays the relevant information succinctly to assist monitors in completing their own work processes. From there, they can review site events and validate inputted information against the raw data. Empower your study subjects by letting them send in their data by themselves from their own devices. OpenClinical supports the BYOD system for your patients to access the dedicated portal for providing their data. To ensure the timely transmission of information, the application notifies them when they need to deliver observations. Instead of regularly setting up meetings with sponsors, allow them to view the progress of the studies they are championing by themselves. OpenClinical has a portal for them as well where they can update themselves with your study advancement. Plus, this lets them make certain that every activity and event is in line with regulatory compliance. OpenClinical enables you to connect with existing laboratory, HER, patient database, CTMS, and single sign-on solutions for a more streamlined exchange of data. Other than that, the software has SOAP and RESTful APIs that you can use for further integration purposes. The community of OpenClinica is working to provide complete translations of the interface in more than ten languages. The Spanish, French, Japanese, Hungarian, and Italian translations are fully functional and you can use these instead of English to provide a more comfortable environment for your diverse group of researchers. If you are considering OpenClinica it may also be a good idea to examine other subcategories of Best Clinical Trial Management Software listed in our database of B2B software reviews. Each business is different, and may call for a specific Clinical Trial Management Software solution that will be fit for their business size, type of clients and staff and even particular industry they cater to. It's not wise to count on locating a perfect services that is going to work for every business regardless of their background is. It may be a good idea to read a few OpenClinica reviews first and even then you should remember what the solution is supposed to do for your business and your workers. Do you require a simple and intuitive solution with just basic functions? Will you actually use the advanced functionalities needed by experts and big enterprises? Are there any specific features that are especially beneficial for the industry you work in? If you ask yourself these questions it will be much easier to find a reliable solution that will match your budget. How Much Does OpenClinica Cost? OpenClinica currently offers three enterprise pricing options that help you focus more on your research and not on technical and administrative tasks. The packages and their inclusions are outlined below to help you decide which one is the most suitable for your research organization. Aside from the paid applications, OpenClinica also provides a costless edition, whose features are also included in the paid packages. Take a look at the inclusions of the free version to see if it is suitable for your needs. We realize that when you make a decision to buy Clinical Trial Management Software it’s important not only to see how experts evaluate it in their reviews, but also to find out if the real people and companies that buy it are actually satisfied with the product. That’s why we’ve created our behavior-based Customer Satisfaction Algorithm™ that gathers customer reviews, comments and OpenClinica reviews across a wide range of social media sites. The data is then presented in an easy to digest form showing how many people had positive and negative experience with OpenClinica. With that information at hand you should be equipped to make an informed buying decision that you won’t regret. What are OpenClinica pricing details? 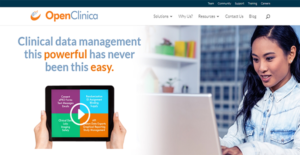 What integrations are available for OpenClinica? OpenClinica also offers Enterprise users access to SOAP & RESTful APIs. You can learn more about integrations from the website or from the support team.